This month saw an obscure joke from 1998 morphing into a minor controversy. It was quickly resolved, but the episode offers an interesting glimpse into the shared culture of geeks — and the often overlooked communities that keep it all running. And it also brought a new round of attention to a terrific April Fool’s joke. The story begins in 1998 at Xerox’s famous PARC research center in Palo Alto, where Larry Masinter’s duties included working on web and Internet standards. (Two years later he joined Adobe, where he’s been ever since — still continuing his standards work as a principal scientist in their corporate standards group). On April 1, Masinter unveiled — drawing on the contributions of others — what he later described as “a satire on the many bad API designs being proposed,” which included a mock HTTP status code. The humor gradually emerged through a mist of technical details. While web servers recognize addresses beginning with http:, under Masinter’s proposal appropriate servers would now also begin recognizing “coffee:." The protocol also identifies some important security considerations. (“Anyone who gets in between me and my morning coffee should be insecure.”) And it warns direly about the possibility of “denial of coffee service” attacks. It was in section 2.3.2 that a throwaway joke specified a soon-to-be-famous return code. “The IETF regularly each April 1st also publishes humorous specifications (as ‘Informational’ documents), perhaps to make the point that ‘Not all RFCs are standards’, but to also provide humorous fodder for technical debates,” Masinter wrote, explaining the complete backstory of the message. “The target of HTCPC was the wave of proposals we were seeing for extensions to HTTP in the HTTP working group (which I had chaired) to support what seemed to me to be cockeyed, inappropriate applications. As the years rolled along, the exquisite parody quietly attracted an underground following, and fond tributes to the error message started appearing in actual real-world programming languages and platforms. Google even has its own version of the error at Google.com/teapot. Click it to make it pour! Over time new incarnations of the silly “I’m a teapot” error have occasionally served some useful purposes — at least, if you believe reports on Reddit. “I’ve seen DreamHost throw 418 errors in response to brute-force login attempts, probably to confuse hackers or something…” And a similar response apparently turns up in at least one WordPress plugin. In 2015 Masinter — now a principal scientist at the IETF — turned up in a thread on Twitter to remind everyone that yes, it was meant as satire. @ExceptionFound Satire: make fun of many bad HTTP extensions that had been proposed. Earlier this month, when the error message got some high-powered attention from Mark Nottingham, the chairman of the IETF working group that oversees hypertext transfer protocol. His service to the geek community includes co-creating the Atom XML language for web feeds, and he’s also worked as a principal technologist at Yahoo, a systems architect at Rackspace, and a research scientist as Akamai, before accepting a position in August at the content-delivery platform Fastly. On Aug. 5 he made the case for removing support for the error message from Node.js. He made similar requests to the communities handling Go, Python, and ASP.Net. Shane’s post drew thousands of upvotes in Reddit’s programming forum, and over a hundred more when it turned up on Hacker News. Nottingham gamely acknowledged the controversy in a tweet. The community had spoken, and within days Nottingham shared an update on the official w3 mailing list. So, I poked a couple of implementations to see if they’d remove 418’s “teapot” semantics, and there was a reaction (to put it mildly). 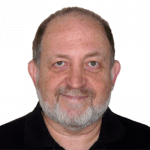 A draft of a new document soon appeared on the IETF site — authored by Nottingham himself. And soon he and Masinter were discussing the best way to collaborate on a response. In the days to come Nottingham retained his good humor — especially on REDbot, one of his own projects, which checks HTTP resources for common problems. 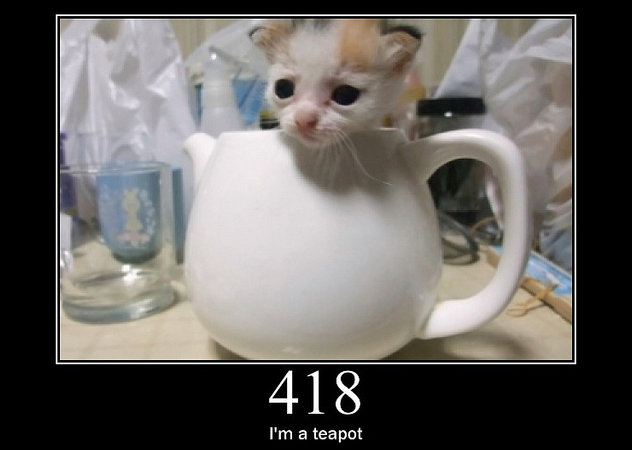 When a developer in Armenia submitted a pull request so REDbot’s code would now also support “HTTP Error Code 418 I’m a Teapot,” Nottingham quickly approved the change, and had it deployed by the next day. A hotel in Singapore offers a room-service robot. Walmart wants to patent floating blimp warehouses to stock drone deliveries from the sky. Cosmonauts launch a 3-D printed satellite from the International Space Station. Helpful suggestions and infographics available from the “Social Media time alternative calculator”. Facebook asks: what should we do with the web pages of the dead? BoingBoing celebrates the 22nd anniversary of its oldest web page. Music composer for the 1990s game “Wing Commander” raises money to record it with an orchestra. The FBI just got new evidence in the 46-year-old D.B. Cooper case. Paul Allen’s crew finds the 1945 wreck of the USS Indianapolis. Feature image by Tomomi Imura via Flickr, CC BY 2.0.